WITH financial institutions of emerging economies like India and China getting big time into development lending, the World Bank plans reforms to attract its borrowing countries. Some of the important plans are to disburse loans faster and on flexible terms. Bank watchers and civil society groups say the reforms, expected to be in force by the year-end, would dilute the bank’s safeguard policies, which ensure that the bank-funded projects do not harm the environment or people. The safeguard policies came into being in the 1980s following widespread criticism that the World Bank-funded projects are impacting the environment. The protest against the Narmada hydel project in Gujarat was a catalyst in bringing about the change. The bank had to withdraw loans for the project. “The reforms will have wide ramifications for India,” says M Vijayan of Delhi Forum, an association of non-profits and community organisations, which demands parliamentary oversight for the World Bank functioning in the country. In 2009-10, India was the highest borrower of the bank. Its loan jumped from US $2.9 billion in 2005 to US $9.3 billion in 2010. By June 2010, which is the fiscal year-end for the bank, it had 104 active projects in the country, worth US $21 billion in loans and US $261 million as grant. But of late, the World Bank is facing competition from banks and financial institutions in countries like India and China. Financial institutions in these countries are providing low-cost alternatives to the World Bank, diminishing its role as a leader in development finance, says Kirk Herbertson of World Resources Institute (WRI), a non-profit in Washington. In the first six months of 2010, the State Bank of India funded US $11 billion for 21 projects in India. In 2009 and 2010, China’s Export Import Bank and its Development Bank lent more to developing countries than the World Bank did. To compete with these institutions, the World Bank plans to adopt another way of lending. As of now, governments could borrow for specific projects (investment lending) and for broader policy and institutional reforms (development policy loans). The new lending instrument, Programme for Results (P4R), would finance governments in installments based on their ability to demonstrate results. Analysts say the first casualty of the P4R lending would be the safeguard policies. Though the bank indicates this new lending instrument would cover projects that have low impact on communities and the environment, a closer look reveals it would apply to all categories of projects. The bank also plans to finalise a loan faster and outsource the responsibility of safeguard policies to borrowing countries. This means it would provide less guidance on environmental and social safeguards and leave it to operational teams in borrowing country. Jelson Garcia of Bank Information Center, a non-profit in Washington DC, says the reform proposals dilute safeguard policies and accountability in the race to stay afloat and keep its attractiveness to middle-income countries that share 60 per cent of the bank’s lending exposure. Kirk explains: with donor governments struggling with their economies, the bank’s budget has become restricted. The management is cutting down budget for several operations, including safeguard policies. The bank has not clarified how its new portfolio would be distributed among the three lending instruments. As per an analysis of loans disbursed in 2010 by WRI, the reforms mean the bank’s P4R lending could be 46 per cent and development policy lending 38 per cent. This leaves the bank’s safeguard policies to be applicable to 16 per cent of its total portfolio. Currently, safeguard policies are applicable to about 50 per cent of the bank’s lending, indicating an already weak safeguard coverage. The bank’s safeguard policies are under revision from this year after an internal audit found they were never effectively implemented or followed up. The revision aims at dovetailing all policies into one policy thus diluting them, and shifting more responsibilities for dealing with social and environmental concerns to borrower governments. 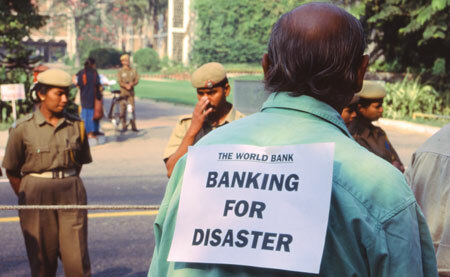 “It is time the World Bank functioning is brought under parliamentary supervision given that its own accountability is low,” says Joe Athialy, a Delhi-based activist who has been tracking its safeguard policies.